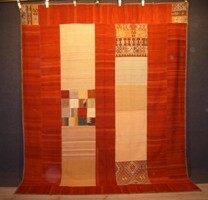 The Kilims of Iranian nomads are hand-woven and they were used as tent curtain, floor covering, blankets, or saddlebags. 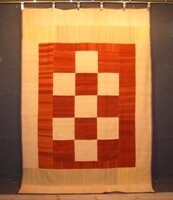 Today carefully chosen fragments of Kelims are sewn together by hand in creative and often surprising arrangements. 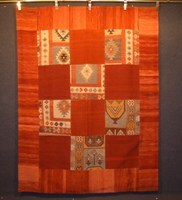 The resulting unique pieces have a large variety of uses: Not only as floor covering but also as tapestries and duvets. 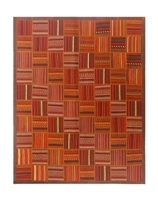 Patchwork Modern: Colourful square or rectangular patches in refined tile-like arrangements. 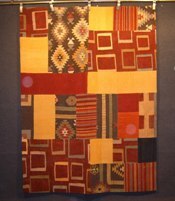 Patchwork Special: Multi-coloured and often very big framed patches with small striped patterns that are reminiscent of artistic wickerwork or modern graphic arts. 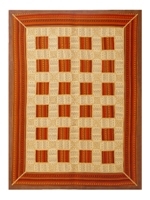 Patchwork Classic: The patches are characterized by subdued colour patterns and a great variety of forms. Remarkable arrangements, often in honeycombed forms made by hexagonal patches contrasting with the own patterns of the patches, give these carpets their distinguishing features.